The US Government spends billions of dollars each year to research new techniques for space launch, yet a viable method has not emerged, until now. There is no doubt that Sky Ramps will work and can be built in a few years. All other proposals for efficient space launch require a decade of expensive research and development before a system can be tested. Even the most promising ideas may cost as much as the $550 million Space Shuttle missions. Here is a review of other launch schemes that consume billions of dollars each year for endless research. The idea of using a tremendous surge of electricity with magnetic levitation (maglev) technology to hurl an RLV off a ramp is interesting. NASA's Holloman horizontal test track in New Mexico has achieved Mach 8 using electromagnetic propulsion for small objects. However, the largest electromagnetic launcher envisioned (ELAM) will put out only 14 M-joules of power, yet at least 140 Gig-joules are needed to propel an RLV to Mach 1 up a 45 degree incline. So they need 99% more electromagnetic energy than they can produce today. This means they must invent a mechanical method of storing all the needed electricity before releasing it within a few seconds into a 2.5 mile inclined track. This method will require a large nuclear power plant to gradually produce the needed power, so it will not cost just a few thousand dollars per launch as some have written. A NASA contractor recently claimed he could provide 400,000 lbs of maglev thrust for 350 feet, but this is just slightly better than ELAM, which hasn't been proven either. Nevertheless, NASA's Marshall Center wants to spend a billion dollars to build a 1.5 mile horizontal track at the Kennedy Space Center with hopes of accelerating an RLV-size object for 9.3 seconds to reach speeds of 400-600 mph. This effort is misleading since the constraint of gravity is ignored. The entire challenge to making orbit is to escape the Earth's gravity, so a horizontal track proves nothing. Your car can exceed 100 mph, but cannot go up a 45 degree ramp. Any kinetic energy gained from horizontal launch is lost as an RLV must strain to turn upward through the Earth's dense atmosphere. Suggestions that a ski jump ramp at the end can loft an RLV skyward ignores physics. The G force from a sharp curve would crush the sled into the track and injure or kill passengers, while a long gradual ramp will drain all the kinetic energy generated. To propel an RLV 400-600 mph horizontally, you can build a 45 degree two mile railroad track down a steep mountain. Then you can let an X-33 size RLV simply roll down and let gravity do the work. The RLV will reach 500 mph as the track levels out, but this cheap method is pointless because horizontal speed is of little value in space launch. Maglev has been used by trains for years, especially in Japan. They routinely move 60 ton objects up to 200 mph. Therefore, NASA doesn't need to spend a billion dollars to demonstrate this. Maglev research must focus on the challenge of storing electrical energy and not waste resources pretending this technology is ready for space launch. Electromagnetic assisted launch is much like solar power, interesting and worthy of research, but not a viable technology for space launch at this time. However, if these technological obstacles are overcome in the future, electro-magnetic assisted launch will require the same 2.5 mile inclined sky ramps as rocket sleds. Any ground-based assisted launch method needs that length to develop Mach+ speed at a safe acceleration rate of less than 6 Gs. 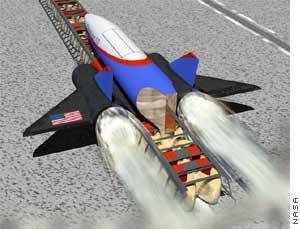 Therefore, sky ramps built for rocket sleds can be converted for use as electro-magnetic launchers in the future. Electro-mag supporters should view rocket sled launches as a first step and support the idea of building a system immediately to prove the advantages of inclined sky ramp assisted launch. Afterwards, they can obtain funding to build a rocket sled sky ramp with mag-lev suspension and minor electro-magnetic thrust. A working sky ramp will produce the revenue to justify the construction, operation, and continual improvements at this experimental hybrid rocket-electro-magnetic launch site, with an eventual goal of producing enough electrical energy to eliminate the rockets on the sled. Once again, electro-magnetic launch has major technological hurdles to overcome that may take decades. However, if rapid and unexpected breakthroughs occur, rocket sled sky ramps can be converted. When people see the Space Shuttle piggybacked aboard a 747, some think it would be easy for the 747 to fly up near space and launch the Shuttle into orbit. This is impossible for four reasons. First, a large aircraft like the 747 can only fly about 8 miles high, which is little help. Second, the heavy drag of a piggybacked RLV means a launch speed of .5 Mach, meaning the Shuttle would need to generate 23.5 Mach on its own. 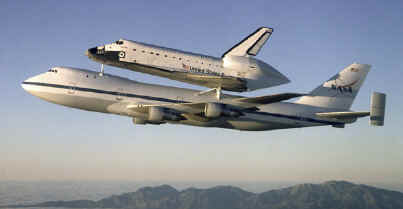 Moreover, a 747 can only lift an empty Space Shuttle that has no fuel. For example, two gasoline cans may look identical, but one full of fuel weighs 10 times more than an empty one. Proposals to tow an orbiter to 20,000 feet with a 747 have been studied, but the problem of take-off weight and limited horizontal assist velocity are the same, plus the severe airframe stress from a tow line. If this were possible it would be simple to demonstrate, but reality deters testing. The only solution is to build an airplane three times larger than a 747. This would take a decade and cost billions of dollars. Moreover, it could only provide an assist of .5 Mach. The only alternative is a rocket-powered airplane, but this presents more problems. First, it requires large wings, which are heavy and cause drag if a rocketplane attempts to fly past Mach 1. Second, it requires massive landing gear to support the take-off of a fueled aircraft and fueled RLV, rather than light landing gear for just landing empty like the Space Shuttle uses. Third, it burns a lot of fuel turning upward in the dense lower atmosphere after take-off. The path of an RLV launched up a ramp is depicted in green below, and one launched horizontally is depicted in orange. As you can see, the orange path is roughly 30% longer than the green. It also stays in the dense Troposphere twice as long, where 90% of the Earth's atmosphere exists. Therefore, launching an RLV vertically or up a steep ramp is much better since large wings and massive landing gear are not required to take-off like an airplane, and it provides a much shorter path to orbit. Nevertheless, Andrews Aerospace has proposed a reusable rocketplane. This idea requires major technological breakthroughs to construct: the world's largest aircraft; the world's fastest aircraft; and a rapid method of making liquid oxygen while airborne. Its website (linked in blue above) shows the massive rocketplane during reentry, which requires hundreds of heavy ceramic tiles. Generating its own oxygen while airborne is interesting, but how much will that device weigh? This concept also wants to haul deadweight of several large jet engines and 20,000lbs of jet fuel into Space each time. There are major technical problems with this concept which require billions of dollars in research just to see if the idea is feasible. For example, the rocketplane shown on their website seems half the size needed to carry the necessary fuel. While they claim it could launch payloads at half the cost of the Space Shuttle, that is still more expensive than today's expendable boosters. A simpler idea than Andrew's liquid oxygen "Alchemist" machine is to link up with an airborne tanker. Both these ideas hope to allow a huge aircraft full of fuel to get off the ground. Although tanker operations are common in the US military, they take time and can be dangerous with large aircraft due to air flows. Lining up for mating, connecting the boom, and pumping all that fuel or oxygen through a boom may take up to an hour; so another hour of fuel is needed at take-off. A special rocket powered tanker may be needed to match the speed of a rocketplane, and using a tanker for each mission is hardly a money saver. Using any type of aircraft to piggyback launch an RLV creates more problems than it solves. It provides no meaningful assisted launch since the best an aircraft can provide is a sub Mach horizontal release. The only viable method to employ a rocketplane is to launch it from a Sky Ramp; which eliminates the need for large wings, massive landing gear, and post-launch airborne fueling gimmicks. The idea of a reusable booster has already been done; it's called the Space Shuttle and costs $550 million a mission. The Shuttle's two boosters separate about 28 miles high and float down until about 2 miles where parachutes deploy (left). They splash down at 62 miles an hour and are recovered by boats, then shipped by rail to Utah for inspection and preparation for reuse. The large external fuel tank is not recovered. The entire Space Shuttle program is considered a failure since it's more expensive than using expendable multi-stage rockets. Nevertheless, this idea has been reinvented by Kistler Aerospace. The Kistler method will attempt to reuse the entire first stage (read their website linked in blue). The booster must fly back near the launch site after separation, which adds complexity and requires significant extra fuel. Reusing the booster 100 times depends on 99 perfect deployments of six massive parachutes and 99 perfect landings on hard ground. The Shuttle's boosters land at 62 mph, Kistler hopes to offset this with airbags. However, the walls of a booster are thin and light to save weight, so they cannot withstand much impact. Kistler plans on using a booster casing which can withstand 4 Gs of force, which adds weight and may prove too weak. In addition, moderate winds or a minor malfunction could send it tumbling, especially since airbags may bounce the booster. Loading the huge booster off the desert floor and returning it to a launch pad is not a simple task. This will require many expensive man hours, especially the recovery, cleaning, and repacking of the massive parachutes. The off-road ride back to the launch site may cause further damage. At the launch site, it must be unloaded for inspection, then moved, mated, and placed upright for the next launch. This is a huge, fragile booster which will suffer catastrophic damage every few missions, which is why NASA doesn't recover and reuse the Shuttle's external fuel tank. A reusable booster will prove itself an expensive semi-reusable compromise, once again. Rather than recovering a booster after a parachute landing, why not land it for reuse like an airplane? This idea is realistic, but will take more than a decade of research and development. The fundamental problem is that in order for a first stage rocket to fly back and land while the second stage (RLV) makes orbit, both must launch with a large amount of extra weight in the form of wings, extra fuel to maneuver home, landing gear, and a strong enough body to not break up at landing. So the first stage must be larger to carry an extra rocket engine and more fuel to carry the extra weight it needs to land like an airplane. As a result, you end up launching something much larger than the Space Shuttle trio. You must also fly and land the largest airborne craft in history. It will be four times the size of the RLV and cost billions of dollars to build. Something that large and complex will not be reused until after weeks of inspection and repositioning. This method is preferred by large aerospace companies because research and development will be lengthy and profitable. The Marshall Flight Center has information and artist depictions of these complex and expensive proposals. Few require technological breakthroughs, but the designs will be massive and very complex, which is unlikely to result in low-cost space launch. Air breathing (ramjet or scramjet) engines are of no value in putting spacecraft into orbit. They are a promising propulsion method for hypersonic aircraft, missiles, and projectiles within 100,000 feet (19 miles) of the Earth’s surface. Sky Ramps are the ideal launch method for “hypersonics” since they must be propelled to near Mach before their engines ignite from the incoming air. However, ramjets cannot generate meaningful velocity to assist a rocket powered spacecraft attempting to gain orbit during the one minute of flight to 100,000 feet before their “free” oxygen disappears and they become deadweight. The basic problem is the air resistance caused by the dense atmosphere requires increased thrust to gain higher velocities. The best ever designed was the sleek SR-71 spy plane which can reach Mach 3.2 at 80,000 feet. This resistance can be reduced by flying higher in thinner air, but this starves the engine of oxygen to burn. Hypersonic aircraft without jet turbines can fly faster and up to 100,000 feet, but the scarce oxygen sucked in at that altitude limits thrust. One idea is to use ramjets as a booster up to 100,000 feet since they need only one-sixth the fuel of a rocket engine. If a Sky Ramp can launch a spacecraft at Mach 2 at 10,000 feet and a 45 degree angle, the ramjet would have a minute of burn time. However, the dense air under 50,000 feet would limit it to Mach 2, so perhaps it could make Mach 4 at 100,000 feet before it runs out oxygen. Then rockets would fire to propel the spacecraft to Mach 24 and into orbit. This seems helpful, until you evaluate the weight and size of the ramjet engines needed to propel a spacecraft upward. The latest engine built by the Russians produces around 308,000 lbs of thrust, which is impressive considering that modern supersonic jet turbine engines produce just 30,000lbs of thrust. However, it measures 16 meters in diameter, and ramjets are not fuel efficient or capable of full power until around Mach 3. In summary, the weight and size of air breathing engines negates any fuel efficiency they can provide for a minute of flight time, not to mention the complexity introduced. Another idea is taking off a horizontal rail and slowing gaining altitude and speed to reach Mach 7-18. The air density below 50,000 feet would limit speeds to below Mach 2 and the fuel savings is erased by flying a longer path. A fully loaded RLV cannot fly on its wings, so the fuel consumption in the atmosphere is tremendous. A third concept is quickly climb out of the dense lower atmosphere and level out at 100,000 feet to allow scramjet engines to propel it to Mach 7-18. If this is done, it also lengthens flight time to orbit which negates fuel savings. In all these examples, the ramjets would need much more fuel than taking the shortest path to orbit, which is also the shortest burn time for the ramjets. 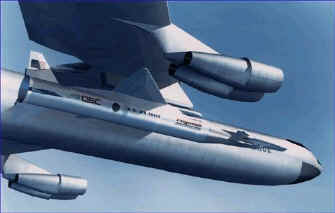 Keep in mind, proposals to fly air breathing craft at 100,000 feet faster than Mach 4 are just fantasies at this time. Hypersonic flight technology is still in its infancy despite billions of dollars spent by a full-time NASA research program. The world record aircraft speed of Mach 3.2 was set by the SR-71 over 30 years ago and has remained unbroken for many technical reasons. However, some high government officials have recently thrown out wild ideas of flying up to Mach 18 with air breathing engines. The problems of shock waves, control surfaces, and engine performance are daunting. No one has explained how to maneuver an aircraft moving at hypersonic speed to an orbital path. The current state of the art is the X-43A (right), a 2200 lb scramjet missile which NASA hopes to fly Mach 7-10. The problems of flying a fat RLV like the X-33 at Mach 7 under 100,000 feet are insurmountable, at least for decades. There is some interest in "combined cycle engines", basically a ramjet engine that can also function as a rocket. This idea still has the fundamental problems of any airbreathing spacecraft. It has the benefit of saving on oxygen from the air (O is 18X heavier that H) but has a surface to volume" ratio that is large and must spend a great of deal of time in the air (drag force) accelerating up to hypersonic speeds to justify its extra weight and drag. The big question for combined cycle is how to balance these merits and demerits. For example at 100,000 feet the air is about 1/30 the density(=rho) at the surface but the drag force goes rhoXv^2 so at mach 5 we have that v^2 is about 25 times that at mach 1. Thus the effects of the higher velocity and lower density approximately cancel out for the drag force here so you have a drag force that is approximately equal to about that at mach 1 near the earth's surface which is large. Thus if you have this drag force over tens (or hundreds) of miles the work done by the air against the vehicle is very large, a great deal of your fuel is used just in pushing air. A simple calculation on a X-33 crossection (in the drag equation, just multiply our drag force by 30km distance (at 3g) to get the approximate work done) shows that it uses up all the benefits of not needing the LOX. In that regard you cannot reduce the drag crossectional area by that much since the hydrogen still has a lot of volume (the weight is far lower, but the volume is lower only by a third) assuring still a large crossection for drag. If you streamline the system you radically increase the surface to volume ratio (which is already large for a jet anyway) assuring that you have a lot of heavy surface to carry and (with the high surface to volume ratio) relatively little fuel to do this (in comparison to the surface weight). And if that was not enough of a problem the jets must be augmented by a heavy rocket (that must accelerate all this deadweight) in any case to get the extra mach ~10 needed to orbit. Note that m/mo is way too small for this part of the flight because of all the jet engine deadweight that also must be accelerated into orbit if those 'streamliners' get their way. Can you go higher than 100,000 feet to reduce the drag force? Yes, but you then also reduce the oxygen input and therefore increase the distance required to get to mach 5, making the work done against air about the same and so not changing anything in the above analysis. Combined cycle is a real can of worms. On the other hand, a ramjet powered fly-back first stage booster seems ideal. Ramp launch this vehicle up to 0.5 Mach to ignite its engines and allow it to accelerate at a steep angle to Mach 5-7 to 100,000 feet where it releases its upper stage and flies back home. A ramp also allows much smaller landing gear for landing empty, rather than one five times larger for taking off with fuel and payload. Scramjets are popular with NASA, even though it hasn't proven one after years of expensive research. The other problem is that a ramjet or scramjet will reach 100,000 feet well before Mach 7. The option of flying a longer path through the dense lower atmosphere is impractical, as described in preceding paragraphs. NASA should develop a modern, reliable ramjet which can be tested by the SR-71 for potential use as a first-stage fly-back booster. The US Congress has begun to ask why the nation provides $15 billion a year for NASA to spend on overhead and "demonstrators". The Space Station project is in trouble because expected reductions in launch costs have not occurred. The US Air Force is anxious for a viable method of inexpensive space launch and wants to start its own RLV program. 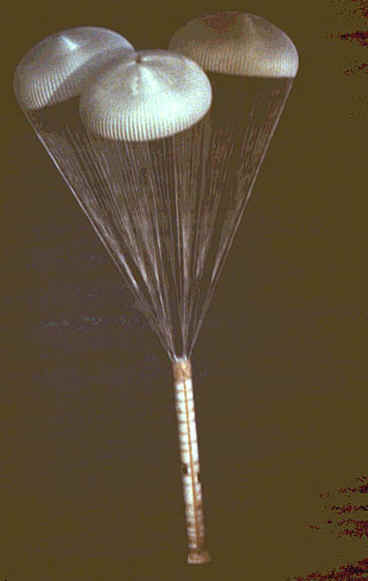 Rocket Sled Assisted Launch has emerged as a superior method to any of NASA's SLI launch proposals and does not require research or demonstrators. A simple sled and track will cost less than a monstrous $10 billion fly-back booster or rocketplane, and will never crash. However, new ideas face resistance from the "not invented here" attitude of large corporations and government institutions. If this technique is ignored in the United States, it will eventually appear overseas and eliminate America's dominance in Space. Rocket Sled Assisted Launch is viable now. It has already been demonstrated several times when the Navy's China Lake test track sped a 130,000 lb object along steel rails to Mach 4. All other proposals require at least a decade of expensive R&D and are unlikely to result in inexpensive space launch, especially not RLV launch.